At the tail end of last year we received a Squish 18 kids bike to review from Tandem Group Cycles in Birmingham, who are makers of other well known bike brands as Dawes and Claud Butler. It was the first 18" wheeled bike to come through the doors at Cycle Sprog, so as you can imagine we were pretty excited to be able to bring you this Squish 18 review! At the time we received the bike, we did a detailed first impressions review of the Squish 18, discussing its components and build to give a feel of how it's put together and whether it represents good value for money. Then it got sent out to our eager reviewer Katherine to put the bike through its paces, and this is the follow up article that covers how the Squish 18 got on during the review period. So what is the Squish 18? The Squish brand was launched in 2017, as a new range of lightweight kids bikes at a lower price point than some of the more mature brands. This model, the Squish 18, is a single speed bike designed for kids that are not quite ready to make the jump from a single speed 16" wheel straight to a 'geared' 20" wheel bike. The Squish 18 kids bike has a 9.5" frame, which is designed for children with a minimum inside leg of 50cm, which is roughly for ages 5 years and older. This is a wheel size that tends to be dominated by heavy, steel framed, cheap bikes, so it's very unusual to see a higher quality bike in this size, which weights in at just 6.9 kg. At £239.99 it's significantly more expensive than the other heavier and less well specified 18" wheel bikes on the market, but the Squish range is in the middle to lower half of the price range when compared with other lightweight bikes on a 'like for like' wheel size. Our 'first impressions of the Squish 18 kids bike' review gives a lot more detail, but here's a quick recap to get you started. Squish have put a lot of thought into the design of their frame, having opted to use a triple butted frameset. More expensive to produce than alternatives, the tubes are thicker at points where strength is needed, e.g. the bottom bracket area and at the welded joints between tubes. This keeps weight to a minimum. The Squish 18 has been designed to keep things nice and simple, utilising a single speed system that has a 16 tooth sprocket on the back wheel and a 30 tooth chainring at the front. The chainset is a child specific item that comes with crank arms that are 114mm long so designed for the shorter legs of younger children. The brakes on the Squish 18 kids bike are supplied by Tektro and feature a standard v-brake system as featured on the majority of kids bikes of this type. Both calipers and levers are from Tektro, with the levers being adjustable for reach to take account of differences in kids' hand sizes. The 18" wheels are a funny thing to see on account of their rarity. However, they come with an alloy rim with cnc machined side walls for a smooth braking surface and a black finish on the spokes to top things off. The hubs spin freely enough and all in all look to be a nice set of factory built wheels for a kids bike. On the tyre front, the Squish 18 comes supplied with a set of knobblies that are designed for use on road or trail. The Tandem Group have been producing these own brand "Cadence" tyres since 2013 when they developed the Dawes Academy range, so they're a tyre designed for a higher spec bike, which is a bonus. The one concern we have is whether replacement tyre choice at this size will be limited. However, if other manufacturers follow suit and bring out 18" wheel bikes, then the tyre manufacturers will likely increase the level of their offering. The Squish was presented to 6 year old Katherine to review, just before Christmas 2017. She's been riding a much heavier "Cherry Blossom" girls bike, and had asked for a new “grown up” bike. Her initial reaction was very positive. She liked the design and the colour scheme (more on that later) and was keen to go out on it immediately. Her first impression was that it went a lot faster than her old bike! Because it's a single speed bike there are no gears to confuse matters, so she was able to master riding it very quickly. Despite the terrible winter we had this year, she was really keen to get out cycling. She braved the cold weather and rode as much as she could - around the estate, to school, at the skateboard park, the seaside promenade and anywhere else she and her sister could persuade mum and dad to go! The steering has been well balanced in all conditions and has led to an increased confidence in ability and particularly speed. Thankfully there have been no major scrapes despite Katherine's best efforts to break the speed limit! 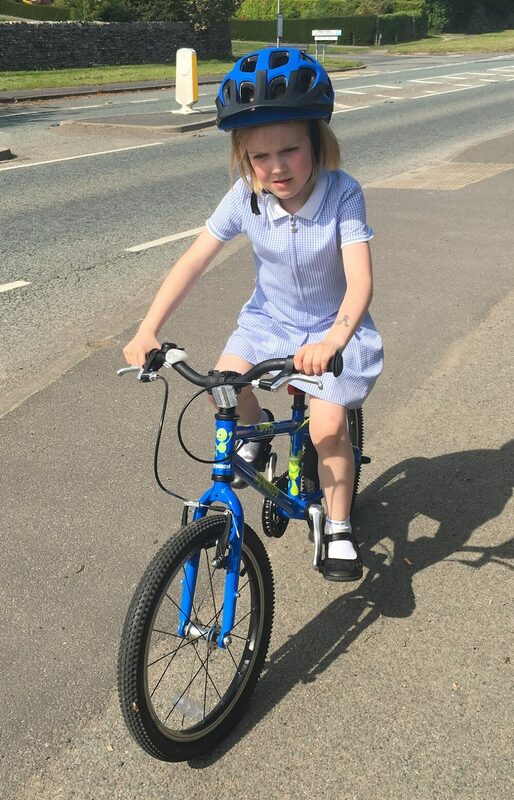 To her delight, she could now beat her younger sister in a race (Jessica had been riding a high end bike for a while and loved to show how she could now get to the top of the hill to school before her big sister!). The bike is very light and compares well with other bikes she has tried in a similar size. The frame feels solid, and shows no sign of wear and tear in the 6 months she's been reviewing it (and it's been used on an almost daily basis). The brakes have had a good work out - due to the speed Katherine's now got she's had her fair share of near misses! The brakes have worked very well in slowing and stopping in an emergency and there are no problems in size matching the brake levers with Katherine's hands (she is an average 6 year old). One thing that has been noticeable is that that Katherine is standing up a lot to pedal (and not just on hills). Her dad has adjusted the saddle height and position a number of times to try to encourage her to sit down more, especially to conserve energy for longer rides, but she continues to ride a lot out of the saddle on this bike. The tyres are solid and well made and have stood up well to mud, sand, the gravelly cycle paths around town, and the occasional bump up the pavement. b) her friends want to swap bikes with her and try out the Squish 18, and needing to use an Alan Key every time delays their fun. However, changing it to a quick-release is an easy job for you or your local bike shop. The bike doesn't come with mudguards. With hindsight we should have fitted some, given the amount of rain we had during the review period! Whilst the adults had initially been impressed with the fun colour scheme and graphics, this has been slightly less popular with Katherine and her peers. There was a bit of a wobble when some of her school friends commented on the green splodges, and the Squidgy man being a bit childish. Thankfully the hurt only lasted a couple of days and she soon went back on the bike, seemingly unperturbed. There are various other colour schemes available, which are a little bit more subtle. Katherine has enjoyed riding the Squish 18, and her parents saw immediate improvements in her bike handling and speed on this bike compared to her old, heavier steel framed bike. The important question is whether they'd buy the Squish 18. It's a difficult question, as there's a real lack of 18" wheel quality kids bikes (most quality manufacturers go from 16" wheel single speed, straight up to 20" wheel geared bikes). This means the Squish 18 is a good choice if your child is midway between the sizes and you want a lightweight single speed bike with reliable child sized components. However, the price means you'd probably be hoping to recoup a fair proportion of the value of the bike via resale, and we're not sure this bike has the same image as some of the other players to guarantee this. There are a number of situations where the Squish 18 is definitely worthy of consideration such as if this is their first move to a pedal bike, your child has outgrown their current 16" wheel bike, they're too small for a 20" bike, or they're unable to cope with gears any time soon. With other manufacturers now offering a small framed version of a 20" wheel bike, there is a lot of competition for bikes for this age group, but Squish seem to have found a niche in the market with this lightweight 18" wheel bike. The Squish 18 has an RRP of £239.99. Squish Bikes are sold through a network of local bike shops, which is great as you can try for size before you buy, and support your local independent bike shop at the same time. However, if like us, you don’t live close to a Squish Bikes stockist, then you can also buy online at Tredz Bikes, who offer free UK delivery plus a free multi-tool. They will also give Cycle Sprog readers a £10 discount if you use the code SNG7NYG2 at the checkout. Disclosures: Cycle Sprog were given the Squish 18 by Tandem Cycles to review. Some of the links in this article contain affiliate links, which means we may get a small commission if you make a purchase through these links. This is how we fund Cycle Sprog - thanks for your support. This clever bike grows from a balance bike into a pedal bike - we take a closer look! The Frog 43 is the smallest pedal bike in the Frog Pond. How will our young testers get on putting it through its paces?